THE BEACH HUT WRITING ACADEMY is an educational co-operative of published working writers. Between us we cover almost every genre, from young adult to crime and short stories to children’s books, non-fiction and script writing. Our world is writing and publishing and we want to share it with you through a range of high quality and affordable courses in Brighton and Hove. And the difference is in the kind of courses we can offer: relevant, responsive to writers’ needs rather than the demands of an educational institute, focussed and specialised, delivering up to date insider information – there’s nothing theoretical about what goes on in our classrooms. Eight weeks. Each session will last three hours. 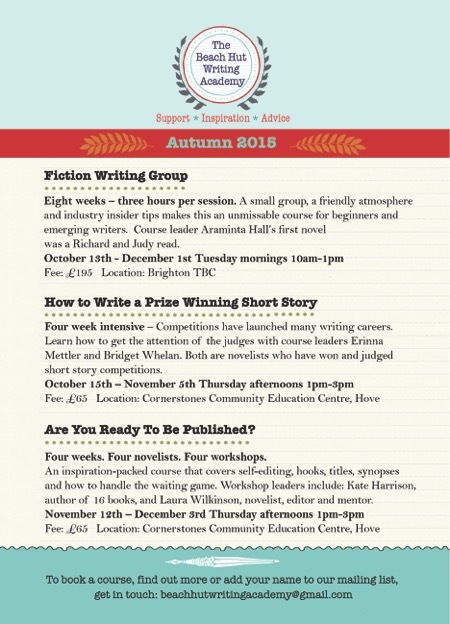 A small group, a friendly relaxed atmosphere and industry insider tips makes this an unmissable course for beginners and emerging writers. Location The Hive in Hove. Four week intensive – you’ll come out with a complete short story and receive a page of feedback written by both tutors. Competitions have launched many writing careers. Learn how to get the attention of the judges for all the right reasons and discover where to send your work. Four weeks. Four novelists. Four workshops. This inspiration-packed course will help you perfect your pitch, so your submission to agents and publishers really stands out. Covering self-editing, hooks, titles, synopses and how to handle the waiting game, these four connected workshops are led by authors who understand the market and what you need to succeed. Workshop leaders include: Kate Harrison (above), author of 16 fiction and non-fiction books, and Laura Wilkinson (below), novelist, editor and mentor, who writes contemporary fiction and steamy romance. Hannah worked as a BBC Television Drama script editor and her radio play, Come to Grief, won Best Adaptation at the 2015 Audio Drama Awards. Sue’s credits include Homefront (ITV) and soloparentpals.com (Radio 4). She is co-author of Bloomsbury’s Writing for TV & Radio. Good for anyone interested in sitcom, comedy-drama, classic serials, original dramas and single plays. This course will include character development; telling stories aurally and visually and getting your scripts ‘out there’. Wish I lived in Brighton! Oh & I love the title!!! This entry was posted on September 3, 2015 by bridget whelan in Muse, News and tagged Beach Hut Writing Academy, creative writing, fiction, Short Stories, writing competitions.